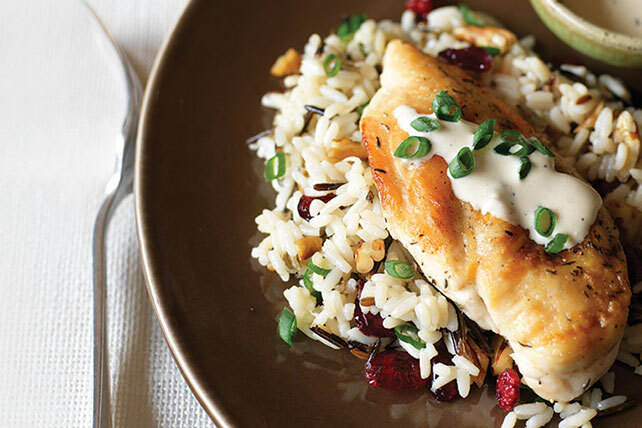 The chicken and rice skillet you cook on weeknights gets upgraded with cranberries and pecans to deliver a weekend dish that wows. Cook rice mix as directed on package. Meanwhile, mix flour, thyme and pepper; use to coat chicken. Heat oil in large skillet on medium heat. Add chicken; cook 5 to 6 min. on each side or until done (165ºF). Stir cranberries, nuts and 1/3 cup onions into cooked rice; spoon onto platter. Remove chicken from skillet, reserving drippings in skillet. Place chicken over rice mixture; cover to keep warm. Add broth to skillet; stir to scrape up browned bits from bottom of skillet. Add cream cheese; cook on medium heat 2 to 3 min. or until cream cheese is melted and sauce is thickened, stirring constantly with whisk. Spoon half the sauce over chicken; sprinkle with remaining onions. Serve remaining sauce on the side. Substitute PLANTERS Walnut Pieces for the pecan pieces.